This the last of the roundup series in its present form. It’s moving to a different model of publication that I hope will do a better job in supporting this site and the content featured here. It’s just going to involve a little lag time. I’m going to be reposting this series onto /r/boardgames as a ‘here’s what you might have missed last year’ regular feature. New roundups will go to our Patrons a year in advance of that before they are then posted to the site and then again to Reddit. I suspect this will do better for those featured in this roundup than posting it directly to MLU, but let’s see. The hype cycle in board-gaming can be oppressive. The constant shifting attention needed to keep up with the new shinies is exhausting. Now though it’s the time of the year to look back on what’s still keeping people engaged and enthused. It’s a time for taking stock. This Reddit thread does exactly that, asking people about their most overlooked games of the year. A lovely Twitter discussion from AnnaMara Jackson-Phelps basically cut to the heart of what we should be asking ourselves on a daily basis – specifically, ‘what could we be doing to be more welcoming to newcomers?’ There are some great suggestions in there. Tanya Pobuda has a marvellous article on inclusivity in board games, looking at the BGG top 200 to see how they represent gender and racial identities on their box covers. It’s a really good read that provides actual quantitative evidence for something I’m sure many of us already know in our bones. Randy Hoyt gave a presentation at the Game Developers Conference about the UX of Board Games – it’s a lovely discussion of some of the things that go into designing great game experiences and it’s worth your attention for sure. Over on To Play is Human, Rebecca Strang has a lovely post listing some of her favourite two-player games. Often it’s just Mrs Meeple and I available so having a good list of convenient classics and recommendations available is wonderful and you might find your next new favourite on here. Elizabeth Hargrave posed a question to Twitter about being asked to do a women’s game designer panel (rather than just a gamer designer panel). The thread is very much worth reading. I certainly wouldn’t want to ascribe the BGG ratings any kind of authority other than ‘this is a rating system that exists’, but I found this discussion over at BGG quite interesting. It notes that there are no games in the BGG Top 50 that were published before the start of this century/millennium. My top two favourite games are Chinatown (1999) and Scrabble (1948) so I’m definitely out of the loop on this. We all know that a pack of cards is versatile but it’s often less obvious as to how versatile. You get an awful lot of games with a pack of cards, and this write-up from Playing Card Decks gives you forty you might consider playing. On a related note, you might also want to take advice on the best way to actually shuffle cards before playing any of them. There are always lots of threads on Reddit about games being added to a collection, but I was far more interested in this one about the why and what of purging. Sometimes a game just isn’t for you, and there’s nothing quite like someone explaining why it wasn’t for them to give you pause for consideration. I’d like to see more of this kind of thing percolating its way through this hobby. I’m a big fan of games in the classroom, as you can probably imagine. Paul Wake and Sam Illingworth have written up their thoughts on the topic of teaching with tabletop games in higher education and I’d very much recommend you check it out. Remember how we wrote up our thoughts about a depth year for 2019? Well, Mrs Meeple has written up her own plans for the same over on her blog. There’s still time to join us! 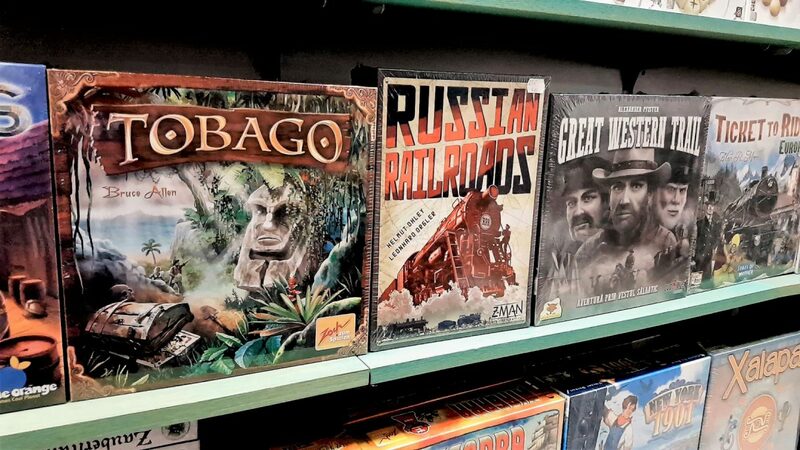 Boardgamegeek occupies a powerful position in this hobby, and every year it does a pledge drive to supplement its income from sponsorship, ads and so on. It’s a relatively controversial approach. This plea to support BGG is not all that remarkable in and of itself, but I found the comments – both for and against – to be interesting. I remain unconvinced that board-games can ever be truly effective engines for delivering real narrative even though I love to see designers trying. Legacy and campaign games come as close as is possible, but I think the required transparency of game systems is too powerful an obstacle to reliably overcome. If you fancy making the effort though, Jaya Baldwin over on James Naylor’s blog has some compelling thoughts on how to approach it. This is short thread on BGG, but pretty funny – if book reviews were written like game reviews. I am, as you may recall, not a fan of Catan. I might be more inclined to sit down and play if my habit of eating board game pieces was properly respected. Here’s a gingerbread version of Catan with which I could make my peace. If you read these roundups semi-regularly you’ll know I love when Johnny Chiodini of Eurogamer DMs a D&D campaign – and there’s a new one starting up on Youtube! This is a lovely late Christmas present for all of us showing we’ve been very good boys and girls this year indeed. Here’s a short but insightful thread from AOBoardgaming over at Twitter, discussing both the consolidation of ‘service dollars’ in a small number of hands and the importance of supporting the smaller outlets. Worth a read. There are a lot of misconceptions people have about accessibility, and one of those is that subtitles and closed captions on videos are the optimal form of accessibility for those that speak sign language. What many people don’t realise though is that sign language isn’t just a physical version of a spoken language, but is instead a translation. The native language for a substantial number of deaf people is a sign language. Reading captions is correspondingly cognitively taxing. That’s why, in an age of auto captions, it’s great to see Youtube channels like Dibs on Blue and Hands on Board Games. Both of these sites do reviews and other content in American Sign Language. Do check them out, and if you have any native signers in your board game group I’m sure they’d like to know about these resources.